If you're like me, snacking is a tricky issue that can quickly blow up all my well-laid food allergy-safe meal plans for the day. I can have a great breakfast and lunch, then at that time between afternoon and dinner (the Brits cleverly invented teatime for that reason, I think) I start meandering around, looking for something tasty to nosh on to take that edge off, even if I'm not really that hungry. And if I don't have something already prepared, I'll go digging -- usually for something salty or sweet, and it's not always a good choice. Dark chocolate (dairy-free) candy bars and potato or corn chips are the usual victims. While they are Food Allergy Queen-friendly, they are certainly not healthy and in most cases are just empty calories. I can do better. Luckily for me, a newsletter from SeriousEats.com just arrived with a recipe for chickpeas (also more clunkily known as garbanzo beans), that are deep fried and salted as a snack. French Chickpea Chips! Yay! The snacking gods have taken pity on me, apparently these are eaten on a regular basis in Nice (which I am told is foodier than Paris, yum). There's a premade version of fried chickpeas that I've found in Indian markets, but I much prefer these. I used dried garbanzos which I had in the cupboard already (soaked overnight), but this recipe uses canned. I think the dried ones would offer a slightly better texture for this snack, but whatever prevents you from eating something nutritionally void, I'm all for it. (1) The recipe is for deep-frying these, but you can certainly bake these as well. I did both, and found that the taste of the fried was infinitely superior. However, if you need to avoid fat for any reason (caloric, IBS, fear of fire), use the baking directions that I include here. (2) If you deep fry, be sure to use a good-tasting, mild or fruity olive oil since they infuse the chickpeas with their flavor. 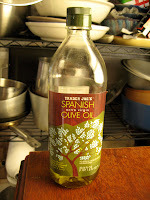 My favorite olive oils are from France or Spain. Italian olive oil tends to taste "greener" and can sometimes be a little bitter, and that would make the snack bitter. I also reduced the amount of oil used for frying, using a smaller high-edged pan and I only used 1/2" of oil. I hate using too much for deep frying unless necessary (like for chicken), because then I reuse the "flavored" oil later. (3) I tried this with both my standby kosher salt and Maldon (Celtic) flake salt since I didn't have any fleur de sel (French flake salt) in the house. Maldon by far made this snack fabulous rather than "just ok", especially since I had to omit the lemon peel due to my citrus allergy. (4) Keep leftovers in an airtight container. I live by the beach and forgot this important fact, in the morning they were soggy and sad. So I had to dry them out again in the oven. Here's the link to the recipe. 1. Fill a small saucepot half full with olive oil (my notes, I only used 1/2" in a smaller pan as to not waste oil), and heat over medium heat until it reaches 350°F. Drop the garlic clove into the oil when it is cold, and remove it as it comes to temperature—just to infuse the flavor into the oil. 2. Fry the chickpeas in batches for about 5 minutes, carefully, as they may splatter. They will go from looking like cooked chickpeas to toasted hazelnuts—smaller, and golden, and crunchy. Drain on a paper towel, and toss with the fleur de sel and lemon zest. TO BAKE: Preheat the oven to 425. In a small saucepan, heat a little (about a 1/4 cup) of olive oil, then add the garlic for a few minutes until lightly browned to infuse the oil. Discard garlic. Let the oil cool. Place the chickpeas in a cookie sheet, and drizzle the oil on top. Shake around the pan to coat all the chickpeas with the oil. Bake for 30-45 minutes, or until they are light brown and look like hazelnuts. Drain on a paper towel, and toss with the fleur de sel and lemon zest. For me, I had to omit both the garlic and the lemon peel, but the flavors were still really good! I could really taste the lovely Spanish olive oil that's my current favorite (I get it at Trader Joes) because it's buttery and mild and less than $10. My snack-searching tummy was satisfied, and because there's more protein and fiber here than candy or chips I was satisfied with less.